A typical static analysis simulation starts off by first choosing the material, selecting fixing points, applying loads and finally running our set up. However, what if we could change this type of workflow and continue with our design when some basic information is not yet known? Testing and validating your designs is always a breeze using SOLIDWORKS Simulation. 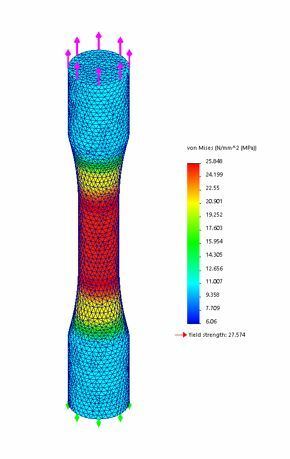 Nevertheless, some designers get easily stuck when it comes to selecting materials and knowing accurate load magnitudes when simulating. Have you ever wondered what happens when you change a material in a linear static stress analysis? Surely if we use a “softer” material like aluminium the stresses should increase drastically. This might be a shock to some of you (honestly it was to me at first), but the truth is…. nothing changes! I quickly obtained my results and noted a maximum stress value of 25.8 MPa at the centre of the specimen, the smaller area should be the place where stresses are mostly concentrated, so far so good. Now let’s duplicate this study and only change the material type to aluminium. Apart from the Yield Strength of the material conveniently placed under the legend, the maximum stress figures are practically the same. How could this be? Two different materials and nothing has changed! has my FEA analysis gone completely mental! Actually no, it is doing its job perfectly fine. You can note a slight difference in the results but it’s just because SOLIDWORKS Simulation uses FEA and not a theoretical approach to achieve results. The key point to remember is that this is a linear static analysis. Apart from the typical assumptions in FEA, displacements are considered to be very small, therefore the area of the neck should not vary much from its initial size. In conclusion, material choice does not affect stress results. Why bother selecting a material in the first place? Whilst stresses remain the same, displacements and strains are a complete different story. These figures depend directly on the material properties, so a “softer” material will tend to deform more than a stronger material, no exciting news there. But with SOLIDWORKS Simulation these displacements can be quickly obtained where hand calculations are often tricky or practically impossible. Calculating stresses is easy when you already know the force magnitude, but what if you don’t know this figure? – Should you wait for this data instead of moving forward? Absolutely not! Remember that the material is considered to be linear, therefore the loads scale up according to their magnitude. So if the force is doubled, then the displacement and stresses will also be multiplied by 2. How can we exploit these simulation hacks in our design workflow? Imagine you have just finished designing your part based on the design space you have available, you know how it will be fixed and have a general understanding on the force direction acting on the part. Excellent, that’s all we need! You can now start creating your simulation study, select any material, apply your fixtures and for the load use a magnitude of 1 N (we’ll see why in a second). I have followed these steps and applied them to the support bracket in the following figure. I chose aluminium for no particular reason (to be honest, it was the closest one to my cursor) and found the following results. The maximum stress on this analysis is 0.020022 MPa when applying 1 N. But what does this value mean? You can interpret it as a “Unit Stress Factor”, this magical number will let you calculate stresses for any load magnitude by using simple multiplication. So if we later find out that the load was in fact 1000 N, then the maximum stresses will consequently be 20.022 MPa. Do you want to know the maximum load that the part can withstand if it was made from aluminium? Easy…. divide the Yield Strength by the unit stress factor. Do you need the part to resist higher loads? Let’s try using stainless steel. I have repeated the simulation just to confirm this shortcut by applying a load of 10328.99 N and selecting the AISI 304 stainless steel. You can tell from the results that the maximum stress is just below the Yield point, thus confirming our assumptions. As long as the fixing points do not chance, and the load position and direction remain the same, we can take full advantage of this simulation approach. By just creating a single simulation we have managed to obtain maximum stresses and loads in seconds! It even helped in our material selection process by doing simple hand calculations. I hope you find this hack interesting yet useful in your everyday simulation, helping you become a simulation master! I’ll leave you with something you can test just for fun on your own time…duplicate one of your studies and invert the load direction… Did you notice the difference? Solid Solutions commenced business as a SolidWorks Training and SolidWorks Support provider in 1998 and has consistently achieved strong growth year-on-year to become the UK’s leading SolidWorks 3D CAD reseller. Growth has been completely organic and has been consistently driven by a focus on recruiting the best from academia and industry and by delivering high quality services to more than 15,000 customers. Our customers range widely in size and are drawn from a broad spectrum of industry sectors. SolidWorks software is used by over 3 million engineers and designers across the world. As a company we are dedicated and focused at providing first class training and support to help you realise the best return on your investment.